391 AD Julius Venator, a Roman plans to save the treasures of Library of Alexandria before it has to be destroyed by the order of the king. He takes a group of soldiers and roman slaves with a fleet of ships and buries the treasure. Before getting back to the ship the natives kills all the slaves, his legion and all his ships lost but one ship Serapis escapes. Lily Sharp, a professor of anthropology at Colorado and her team discovers a Roman coin in Greenland. At the same time a plane carrying Hala Kamil the Secretary General of United Nations, been hijacked and crash lands near the discovery site. Would be dictator of Mexico, Topiltzin wants to change Mexico into old Aztec empire, the US President sends a secret envoy but he kills him and sends back the envoys heart and skin as his answer. Egypt is in turmoil, a fanatic Akhmad Yazid aspires to become the President of that country by revolting and assassinating. A greatest assassin, feared and respected by the CIA and the KGB and one of his hitman Suleiman Aziz Ammar, he uses him for his growth in politics. The book starts with a historical prologue July 15th 391 AD in which Julius Venator, a Roman, along with a group of soldiers and slaves, sail in a fleet of ships ferrying the treasures from the Library of Alexandria trying to save it from Emperor Theodosius I , who had ordered to destroy the works of great minds. Venator a learned man, finds a secret place where he can bury the treasure. After the treasures are safe in the underground cavern his team the Roman soldiers, and slaves are all slaughtered by the natives. While one small ship Serapis manages to get away, they never reach land and the secret of the treasure is lost. Not every time Pitt is there to save Hala, under Akhmad Yazid his favourite mercenary Suleiman Aziz Ammar hatches a fool proof plan and kidnaps Hala Kamil and delegates. A secret meeting takes place in Lady Flamborough in Punta del Este, as Ammar takes over the ship carrying on board the UN Secretary General, President of Mexico DeLorenzo, Egyptian President Hassan and Pitt's father Senator George Pitt. Ammar uses all his tricks to outwit Pitt, did he outwit our Hero? Did Pitt saved the VIP hostages? did NUMA find the secret burial place of Julius Venator? What is the connection between Topiltzin and Akhmad Yazid? all these are revealed in the final chapters of the book. 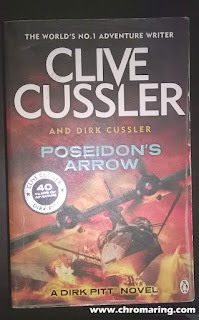 A super fast express ride from start to finish by the author Clive Cussler the Grand Master of Adventure. Some famous lines from the novel. (1) Is there no hope for survival asked Ismad. None, said Ammar firmly. Absolutely none. (2) Giordino was Pitts insurance policy against Murphy's Law. Who are you and what do you want? She demanded in a husky voice with a slight trace of an accent. A dumb question was the first thought that crossed Pitts mind, but he quickly wrote off the woman's testy challenge to shock. He smiled his best Boy Scot trust worthy smile. My name is Dirk Pitt. I'm part of a rescue team from the United States ship Polar Explorer. Sorry I left my driver's license at home. (4) Dinner? asked Pitt innocently, funny thing. Knight continued, Just before Doc Gale surgically repaired the flight attendant torn knee ligaments, she mentioned a dinner date with you too. Pitt had a pure as the driven snow expression on his face. I guess they must be hungry. (5) Lily, climb in the rear and keep your head down. I don't want you hurt. What about me? Giordino asked in resigned indignation. Don't I rate a little concern? Give me one good reason why I should sit up there exposed with you? To protect your trust chauffeur from harm, evil and unsavory felons. Definitely not a good reason. Pitt tried another tack. Of course there's that fifty bucks. I borrowed from you in Panama and never paid back. (7) He has a capacity for appearing in the right place when you least expect him. (9) If they come after us, asked Findley, do we throw rocks? My life is guided by the Boy Scout motto, replied Pitt. He held up a semiautomatic shotgun for Findley "You said you hunted some, Clayton. Here's an early Christmas present. A twelve-gauge Benelli Super Ninety. (10) Welcome to Sam's Roman Circus. Then he noticed Pitts face, cane and limp. "Fall off your motorcycle? " Pitt laughed. "The short end of a saloon brawl. (11) Topiltzin ignored the remark. "You can begin with your name, your title and function in the American bureaucracy. "My name is Dirk Pitt. My title is Mister Pitt. My function is United States tax payer and you can go straight to hell. Ancient India, 2000 B.C. - 800 A.D.